I have a project that requires an odd voltage of 15VDC. The power pack that I plan to build will be two 12VDC 7AH SLA batteries with a DC-DC converter. 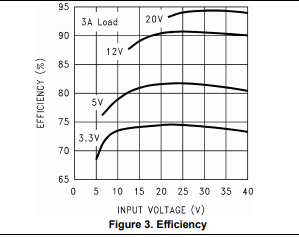 How does the DC-DC converter factor into the load calculations to figure out estimated battery life? How do I figure in losses from the converter? I know that running the same system at a reduced 12VDC results in about a 48 hour runtime on a 12V SLA 1.3Ah battery. At 24V in and 15V out with a 3A load, it looks like the DC to DC will be about 92% efficient. You can directly multiply the available Wh rating of the battery to 0.92 to get the number of watt hours you will deliver to the load. If you are using a cheap Chinese board, the parts might be more or less ideal than the sample circuit in the datasheet, so you will need to measure the input and output current to get the exact efficiency for your system. Note that the LM2596 is a non-synchronous buck converter, you can probably get another 5% or so efficiency by switching to a synchronous converter. Also remember that if you are 92% efficient, you are converting 8% of your input energy into heat at the converter (24V * 3A = 72W, 72W * 0.08 = 5.8W of heat). 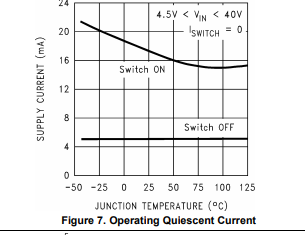 If you are operating at less than 100% duty cycle, then you are consuming the idle/quiescent power when off and consuming load + switch dissipation power when on. Not the answer you're looking for? Browse other questions tagged batteries dc-dc-converter capacity or ask your own question. How do I calculate battery life for my devices? How to calculate battery capacity from its size? Battery Life Reduced From Short?